I believe that I have just invented a useful new word. (At least this will be the first instance of it in these internets.) What it thrill it will be to press "publish." Ready, set, go! 1. Appearing to be informal while holding a serious amount of power over the circumstances of the people in your audience. 2. Giving the appearance of being "just folks" and accessible when you are neither. The governor of Illinois "dropping'" the final "g" while he is formally screwing the residents and public institutions of his state. I feel so very fortunate to be married to a "literary professional" (now retired from teaching college). I'm also fortunate that he has kept a list of the books we read during the 2015-2016 season. We began calling ourselves the "Vacation Reading Club," then the "Summer Reading Club," and then when summer turned to fall, we settled into the "Four Seasons Reading Club." By the organization of the musical year you could say that we are now entering our second season. We sit together just about every day after lunch (sometimes we read at other times, and between books we take a day off), me with a pot of tea, and Michael with a cup of coffee, and we read an average of 20 pages. We take good advantage of our local university library (and sometimes our not-so-local bookseller) so that we have two copies of each book. We often remark on the exact same sentences or paragraphs, and we both crave more Willa Cather once we finish one of her novels. Here's the list of what we have read together during the last twelve months, as well as a list of what we have abandoned. We always vote on whether to abandon a book, and we almost always agree. I enjoyed Our Mutual Friend more than Michael did, but to me it seemed like a random collection of character studies, perhaps of people who he "fleshed out" but didn't use in any of his previous books. Michael has also read a lot more Dickens than I have, so I kind of have a Dickens deficit that should be remedied. I'm removing the specifics here, but this report of the progress of a recent important meeting really makes me angry. 1. Have a secret meeting to change the ____________ rules at the last minute to favor one ________ and give the chair unlimited power without appeal. 2. "Pass" the rules even though you don't have a quorum. 3. At the ____________ make a motion to make those permanent and use the rules to blatantly override the voice vote with no division of the house and no appeal. 4. Use those rules to push through any motion you want while openly ignoring legitimate motions and petitions from the floor. 5. When you discover you've still lost the _________ by over 30 ___________ disqualify 64 ________ and declare your ___________ the winner. 6. Once again use your specially created rules to ram through a motion to accept the count ignoring the no vote from the floor. 7. Ignore motions from the floor to remove the chair. Send the chair up to rapidly "pass" several items of business ignoring an overwhelming no vote. 8. Adjourn the meeting with no motion or vote. 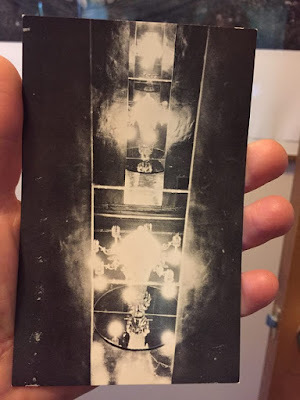 A few years ago I made this post about Ruskay's, the iconic restaurant on Columbus Avenue, where I used to spend my Monday nights playing solo flute music. I finally found my cherished copy of the postcard that the owners used to give to favored guests. 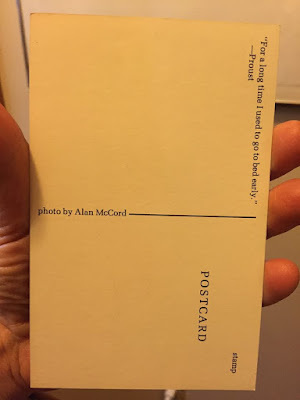 The name of the restaurant is not identified, but the photographer, Alan McCord, is. I hope that this post finds its way to people who remember Ruskay's. If you love poached eggs, but don't feel confident about the poaching part, and you love greens, I have the breakfast (or lunch, or dinner) for you. I have been making this for a couple of weeks now, and this morning I decided to document the process to share here. I use a mixture of pungent greens: mustard, kale, turnip, and who knows what else. This mixture is always satisfying. The mix of flavors (sweet, bitter, spicy) is so interesting that I don't feel the need to add salt (though I have used salt, onion, pepper, and garlic on occasion). Fill a non-stick pot (that you can cover) with greens. Cook on high heat with a little bit of olive oil until the greens turn bright green. Carefully slide in the eggs, turn the heat to medium, and cover. Cook until the tops of the eggs are no longer transparent (2 to 4 minutes--I never keep track). Using a flexible spatula, slide the contents of the pot onto a plate, and there you have it! Michael and I have been spending a lot of quality time with Willa Cather's novels. The Song of the Lark is one that I just had to comment on musically, and in the form of a piece for viola and piano (like I did with A Lost Lady). 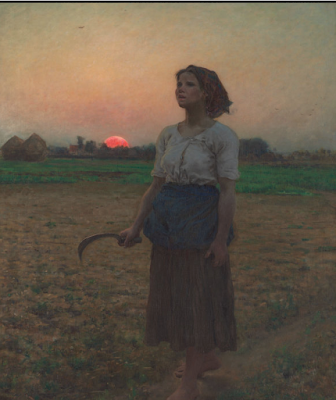 The 1884 Jules Breton painting above, called "Song of the Lark," makes an appearance in the novel. Cather had a close relationship with the painting while it was a relatively new piece of art, and she used a silhouette based on it for the cover of the first edition of the novel. My piece draws inspiration from both the novel and the painting. Here's a computer-generated recording you can listen to, and here's the page in the IMSLP where you can get the music. You might notice that there's a phrase from Edvard Grieg's "Tak for Dit Råd" in the piece. It was one of the pieces that Thea Kronborg, the singer (and main character) in Cather's novel sang. You can hear Kirsten Flagstad sing it below. I like to imagine that Flagstad's type of voice might have been a model for Cather's character's voice.